This man is a former Green Beret. He won a talent contest in Korea with his “Tennessee Waltz.” He’s yodeled Jimmie Rodgers songs to Mongol herders in the South Gobi. On a trip to the Balkans as a member of the United Nations, he formed a band called The Kosovo Mad Cowhands. Kris Kristofferson called him a “musician that got away” in his 1992 Austin City Limits performance. This fascinating man goes by Jeep Rosenberg, born Charles Robert Rosenberg, seems to have enough experiences for seven lifetimes behind him. Now at 68 years old, he’s re-launching a career as a performing songwriter. And as grand prize winner of NSAI’s 2012 Song Contest in the Lyrics-Only Category, he’s got an incredible start. 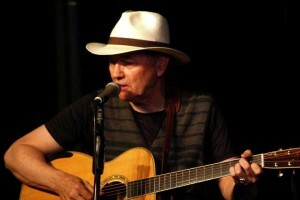 Jeep Rosenberg, nicknamed for his father’s vehicle during World War II, has been writing songs and prose since he was a teenager. For an artist who has been to more countries than most of us could spell, it may be surprising that his music is still so rich in Americana, lacking the stereotypical “world music” vibe. Rosenberg says his folk/country sound isn’t despite his eastern travels, but because of them. In fact, Rosenberg is now working with a Taiwanese poet to re-create an “old hillbilly-vaudeville song” with a Chinese twist. “Kind of my own crazy citizen’s diplomacy,” says Rosenberg. Since being announced NSAI’s Lyric-Only Conest winner, Rosenberg says it’s boosted his credibility, making it far easier to book gigs. Now, he’s working on his next full-length release, and looking forward to his prizes, especially his mentoring sessions with Tia Sellers (“I Hope You Dance” recorded by Lee Ann Womack) and Dottie Moore (“Mile Out of Memphis” recorded by Carl Perkins).